Sony Pictures Classics has debuted the first trailer, poster and photos for the indie sensation Brigsby Bear, which the studio quickly picked up after its debut at the Sundance Film Festival in January. While we don't get to see much from this trailer, it certainly paints an intriguing picture of this world, which is seemingly set in some sort of post-apocalyptic desert landscape, where one family has managed to survive, portrayed by Mark Hamill, Kyle Mooney and Jane Adams. While there is certainly much more to explore than this first trailer has to offer, it certainly presents an intriguing look into this unique world. 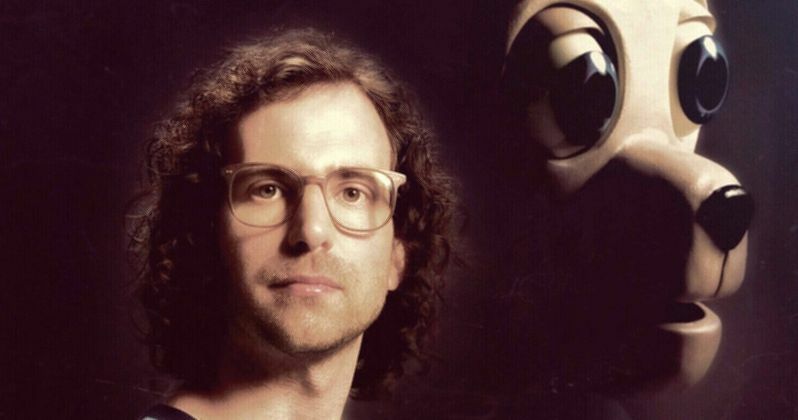 Brigsby Bear Adventures is a children's TV show produced for an audience of one: James (Kyle Mooney). When the show abruptly ends, James's life changes forever, he sets out to finish the story himself and must learn to cope with the realities of a new world that he knows nothing about. The trailer, released by Sony Pictures Classics, largely centers on James and his obsession with the Brigsby Bear Adventures show, with a seemingly endless library of VHS tapes of these episodes, which feature a life-sized bear that is quite reminiscent of Teddy Ruxpin, who seemingly goes on a variety of different adventures. We also see that James lives in an underground compound, and since James has to put a gas mask on just to go outside, we get the impression that something has happened to the outside world, or at least that could be what James has been told. We see James putting on a presentation about Brigsby Bear to his parents, with their compound including an enclosed greenhouse, while another scene shows James' father leave the compound in his car, wearing a gas mask and carrying a briefcase. There is also more footage that is a different re-creation of the Brigsby Bear show in a desert environment. The trailer ends with a family dinner ritual, where all three of them state together, "May our minds be stronger tomorrow," before they each stand up and shake each others' hands. While we don't see them in the trailer, the cast also includes Beck Bennett, Claire Danes, Jorge Lendeborg Jr., Greg Kinnear, Kate Lyn Sheil, Ryan Simpkins, Matt Walsh and Michaela Watkins. Kyle Mooney co-wrote the script with Kevin Costello. Dave McCary, who has written and directed several episodes of Saturday Night live, makes his feature directorial debut. Andy Samberg, who also has a role in the film, serves as a producer with his Lonely Island collaborators Akiva Schaffer and Jorma Taccone, along with Phil Lord and Christopher Miller. Sony Pictures Classics has set a July 28 release date for Brigsby Bear, which will only arrive in limited release, although it isn't clear if there are plans for an expansion later this summer. Also arriving in theaters on July 28 is Focus Features' Atomic Blonde and Sony's The Emoji Movie in wide release, and IFC's From the Land of the Moon, Paramount's An Inconvenient Sequel: Truth to Power, A24's Menashe, Music Box Films' The Midwife and Brainstorm Media's Strange Weather. Take a look at the first trailer, poster and photos for Brigsby Bear below.